Something special happened in Oxford on a warm day in June 2018. 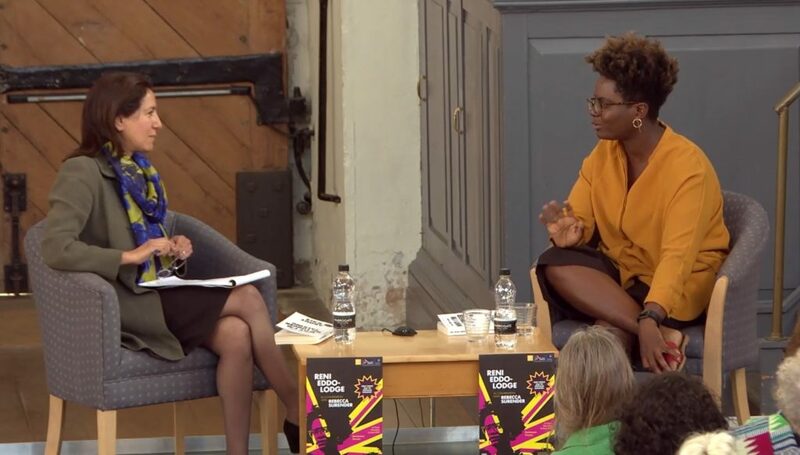 Reni Eddo-Lodge was in conversation with Rebecca Surender, and spoke about her book Why I’m No Longer Talking to White People About Race. 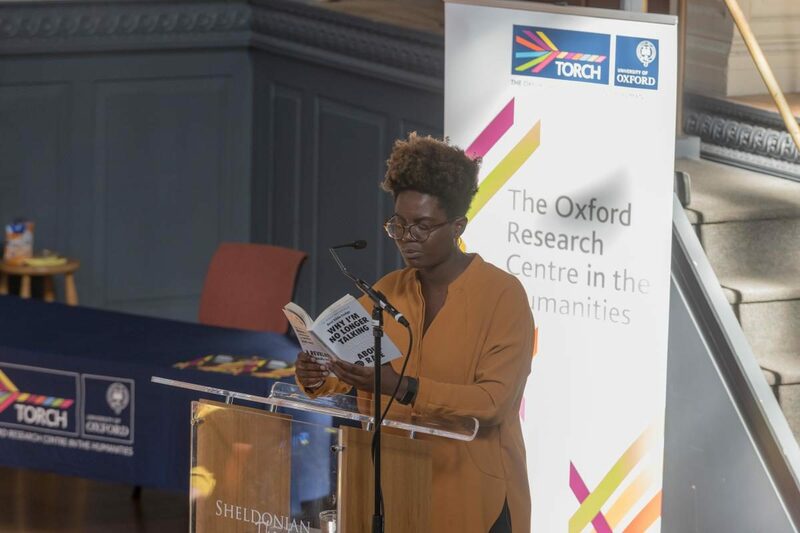 The event, organised by TORCH and chaired by Prof. Elleke Boehmer, was taking place at the Sheldonian Theatre, full to the brim for the occasion. Never before had I seen such a colourful audience at this venue, not even when Nobel Laureate Wole Soyinka gave the University’s annual African Studies lecture there in May 2014. Reni Eddo-Lodge read the watershed essay which gave the book its title. I had read it before, but hearing it from the author’s confident voice brought it to life. 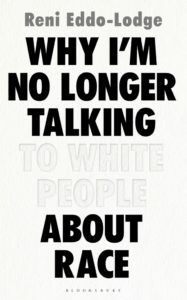 Like many other black readers, I thought she captured perfectly what it felt like to be compelled to stop talking when confronted with many people’s reluctance to ‘see’ race, and to acknowledge its workings in contemporary European societies. As a black woman of mixed heritage (French-Senegalese) raised in France and in Côte d’Ivoire, and being from a different generation, I had expected my experience to be very different from hers. And yet, Reni’s reflections resonated with a life-long experience of self-censorship. Despite some changes since the mid-2000s, France remains a nation where the Republican discourse according to which all citizens are equal, regardless of race, ethnicity, class or gender, is so hegemonic that it is almost impossible to have an open debate about race. Before moving to the UK in 1999, I had assumed that this was a nation that had gone further in confronting its colonial past and its legacy. I have since learned that this is in fact not so much the case (Afua Hirsch’s book, Brit(ish): On Race, Identity and Belonging, discusses this question brilliantly), but I was still surprised by the shared nature of the lived experience of blackness. Listening to Reni, I remembered the times when my younger self had awkwardly attempted conversations with white friends about race, only to give up when faced with blank stares, or with a sudden shift towards a safer topic. I did not want to be the party killer, the friend who brought everyone down. I remembered the feeling of isolation that this silence caused. I remembered the feeling of being watched closely by sales assistants in Parisian shops while browsing through clothes. I remembered fellow French students making jokes about how they imagined me running through the Savannah (in Africa, presumably), and finding me uptight when I didn’t laugh. I remembered finding comfort in spending time with black friends, not so much because we could talk about race, but because we knew exactly what we were keeping silent. I remembered, only a few years ago, sitting at a formal dinner at one of Oxford’s old colleges, and remarking to the white man sitting next to me that I was the only black person among more than 200 guests. My neighbour looked puzzled at first, then shifted uncomfortably in his seat before declaring that it didn’t matter anyway since we all came from Africa if only one went far enough back in time… I remembered all these moments and many more as I sat listening to Reni Eddo-Lodge. I wondered whether, in the wake of student movements in recent years, Reni’s presence at the Sheldonian Theatre and the enthusiastic response of the audience could be a sign that elite British universities were finally willing to engage in a constructive conversation on race. There are signs that this might be the case, and there is genuine commitment from many individuals at these institutions; but it remains to be seen whether real change is underway, or whether the energy that was palpable at Reni’s event will be captured and put into a (ticked) box. Reni’s book lifts the lid on what it feels like to be black in contemporary Britain, and on the myriad ways in which structural racism shapes interpersonal relations. The book also includes a well-researched chapter on the history of black populations in the UK. But others have written about these aspects, too, and it is really in her ability to capture the impact of ‘systems’ on everyday lived experience that the book stands out. Of course, one could critique it for disregarding intersectionality, the many other lines along which people can be discriminated against. But in my view, this would be missing the point: Reni is not denying that these lines are important, too. Where much remains to be said, in my view, is on the predicament of those who do not fit squarely within any category, whether racial or defined in other ways. A significant proportion of today’s European populations connect with multiple identities, but little space is made for the multiple and the in-between to be legitimate. States still treat multiplicity as a threat to the integrity of the nation, and ‘dual nationals’ or those who identify as ‘mixed’ in some ways are often suspected of having conflicting loyalties. But they, too, can feel silenced, and feel that their in-betweenness undermines their claim to full citizenship. My 17-year old daughter was the one who drew my attention to Reni’s book, and she loved the original essay. But her problem is somewhat different from mine. She identifies as mixed-race, or at least not as white since she has a black mum with whom she identifies very strongly; but because she is light-skinned with blue eyes and straight hair, she feels that she often gets ridiculed for wanting to be anything other than white. Why, she asks, am I am not allowed to identify as someone of Senegalese descent? Colourism, at times, produces unexpected effects. But my hope is that Reni’s intervention will encourage younger generations to keep talking about race, for boundaries must be acknowledged before they can be broken down. Cite this: Neveu Kringelbach, Hélène. “Why Reni-Eddo Lodge is inspiring me to keep talking about race”. Postcolonial Writers Make Worlds, 2019, https://writersmakeworlds.com/essay-neveu-kringelbach-reni-eddo-lodge/. Accessed 29 March 2019.